This combination is available as sublingual tablets or film. Buprenorphine/naloxone is used for the treatment of opioid dependence in combination with psychosocial support and counseling for the patient. Contraindications are severe respiratory or liver impairment and acute alcoholism. Side effects are basically the same as those of buprenorphine and other opioids. In addition, naloxone can induce withdrawal symptoms in people who are addicted to opioids. Even though controlled trials in human subjects suggest that buprenorphine and naloxone at a 4:1 ratio will produce unpleasant withdrawal symptoms if taken intravenously by people who are addicted to opioids, these studies administered buprenorphine/naloxone to people already addicted to less powerful opiates such as morphine. These studies show the strength of buprenorphine/naloxone in displacing opiates, but do not show the effectiveness of naloxone displacing buprenorphine and causing withdrawal. The Suboxone formulation still has potential to produce an opioid agonist "high" if injected by non-dependent persons, which may provide some explanation to street reports indicating that the naloxone is an insufficient deterrent to injection of Suboxone. The addition of naloxone and the reasons for it are conflicting. Published data show that the μ-opioid receptor binding affinity of buprenorphine is higher than naloxone's (K(i) = 0.2157 nM for buprenorphine, K(i) = 1.1518 nM for naloxone; smaller K(i) mean higher affinity). Furthermore, the IC50 or the half maximal inhibitory concentration for buprenorphine to displace naloxone is 0.52 nM, while the IC50s of other opiates in displacing buprenorphine, is 100 to 1,000 times greater. 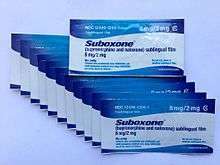 These studies help explain the ineffectiveness of naloxone in preventing Suboxone abuse, as well as the potential dangers of overdosing on buprenorphine, since a continuous infusion of naloxone can be necessary in order to reverse its respiratory effects. The sedating/narcotic effect of buprenorphine is increased by other sedating drugs such as other opioids, benzodiazepines, older antihistamines, alcohol, and antipsychotics. In addition, opioids and especially benzodiazepines increase the risk for potentially lethal respiratory depression. Strong inhibitors of the liver enzyme CYP3A4, such as ketoconazole, moderately increase buprenorphine concentrations; CYP3A4 inducers can theoretically decrease concentrations of buprenorphine. 1 2 3 4 Diane S. Aschenbrenner; Samantha J. Venable (2009). Drug Therapy in Nursing. Lippincott Williams & Wilkins. pp. 396–. ISBN 978-0-7817-6587-9. 1 2 3 Gary L. Fisher; Nancy A. Roget (11 November 2008). Encyclopedia of Substance Abuse Prevention, Treatment, and Recovery. SAGE Publications. pp. 570–. ISBN 978-1-4129-5084-8. ↑ Atta-ur Rahman; M. Iqbal Choudhary (1 January 2010). Frontiers in CNS Drug Discovery. Bentham Science Publishers. pp. 631–. ISBN 978-1-60805-159-5. ↑ Linda E. McCuistion; Joyce LeFever Kee; Evelyn R. Hayes (25 March 2014). Pharmacology: A Patient-Centered Nursing Process Approach. Elsevier Health Sciences. pp. 56–. ISBN 978-0-323-29348-8. 1 2 3 Drugs.com: FDA Professional Drug Information for Suboxone Film. ↑ Mendelson J, Jones RT, Fernandez I, Welm S, Melby AK, Baggott MJ (1996). "Buprenorphine and naloxone interactions in opiate-dependent volunteers". Clinical Pharmacology & Therapeutics. 60 (1): 105–114. doi:10.1016/S0009-9236(96)90173-3. PMID 8689806. ↑ Fudala PJ, Yu E, Macfadden W, Boardman C, Chiang CN (1998). "Effects of buprenorphine and naloxone in morphine-stabilized opioid addicts". Drug and Alcohol Dependence. 50 (1): 1–8. doi:10.1016/S0376-8716(98)00008-8. PMID 9589267. ↑ Stoller KB, Bigelow GE, Walsh SL, Strain EC (2001). "Effects of buprenorphine/naloxone in opioid-dependent humans". Psychopharmacology. 154 (3): 230–242. doi:10.1007/s002130000637. PMID 11351930. ↑ Strain EC, Preston KL, Liebson IA, Bigelow GE (1992). "Acute effects of buprenorphine, hydromorphone and naloxone in methadone-maintained volunteers". The Journal of Pharmacology and Experimental Therapeutics. 261 (3): 985–993. PMID 1376362. ↑ Harris DS, Jones RT, Welm S, Upton RA, Lin E, Mendelson J (2000). "Buprenorphine and naloxone co-administration in opiate-dependent patients stabilized on sublingual buprenorphine". Drug and Alcohol Dependence. 61 (1): 85–94. doi:10.1016/S0376-8716(00)00126-5. PMID 11064186. ↑ Strain EC, Stoller K, Walsh SL, Bigelow GE (2000). "Effects of buprenorphine versus buprenorphine/naloxone tablets in non-dependent opioid abusers". Psychopharmacology. 148 (4): 374–383. doi:10.1007/s002130050066. PMID 10928310. ↑ Clinical Guidelines for the Use of Buprenorphine in the Treatment of Opioid Addiction. Treatment Improvement Protocol (TIP) 40. Laura McNicholas. US Department of Health and Human Services. ↑ Volpe DA, McMahon Tobin GA, Mellon RD, Katki AG, Parker RJ, Colatsky T, Kropp TJ, Verbois SL (2011). "Uniform assessment and ranking of opioid Mu receptor binding constants for selected opioid drugs". Regulatory Toxicology and Pharmacology. 59 (3): 385–390. doi:10.1016/j.yrtph.2010.12.007. PMID 21215785. ↑ Villiger JW, Taylor KM (1981). "Buprenorphine : Characteristics of binding sites in the rat central nervous system". Life Sciences. 29 (26): 2699–2708. doi:10.1016/0024-3205(81)90529-4. PMID 6276633. ↑ Dahan A. (2006). "Opioid-induced respiratory effects: new data on buprenorphine.". Palliative medicine. 20 Suppl 1: s3–8. PMID 16764215.